Egg Harbor Fun Park is a great find in Door County for us kids of all ages! DoorCountyNavigator.com reviews love this place - you will too! Keeps getting better! Expanded gen mining area for kids in 2014, and a brand newm longer zip-line that will run parallel to the highway right in front of the park! We met with Mark, the owner, to discuss the upgrades - cool stuff! Golf, arcades, water wars. . . and now a fantastic "Formula K" super-designed, "Dragon's Tail" go-kart track! You should see the go-kart cars - they are awesome! Egg Harbor Fun Park is THE place to be for mini-golf, arcades, food, water wars, paint ball and now go-karts! And more fun arrived in 2013! Spend the day! Beautiful grounds, shadey spots to sit, fun time for all! We LOVE this place! And it keeps getting better! In 2013, they added 4 batting cages, a giant Dual-Zip-Line racer, and Gem Mining for kids. And pizza delivery too! And don't forget Go Kart Madness every Friday night! $20 6 - 9PM unlimited rides! Like we said - we love this place - and you will too! Fantastic fun for all! NEW! Zip Lining! 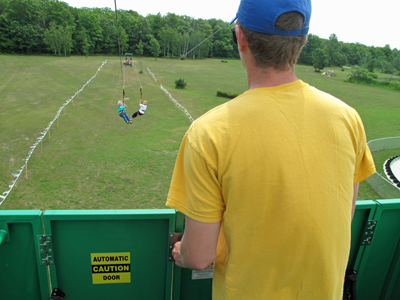 Zip lining is great fun, and now you can do it right here in Egg Harbor at Egg Harbor Fun Park! A Giant Dual Zip Line Racer has been installed - so have a blast. We love zip lining, and this is a welcome addition to Egg Harbor. Fun especially for kids - they can "mine" for gems right on the property at Egg Harbor Fun Park now. Grab a bucket of dirt and potential treasures and sluice it all up and see what treasure you will discover! Who doesn't like batting cages? Well, here they are - all four of them - at Egg Harbor Fun Park now. Practice or test your skills! There is a little bounce zone for the smaller kids with a couple of different configurations. Everytimne we review the park, kids are enjoying this feature. For starters, there is a wonderful 18 hole mini-golf course done up in a nautical theme. 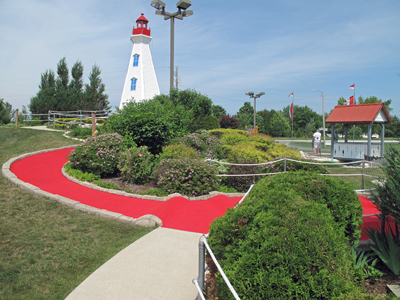 You will see the towering lighthouse in the center of the course, a gorgeous covered bridge, waterfalls - and new in 2013 - colorful "greens" in reds, purples and of course - green! You will know you have arrived. A course designed to be challenging, but also designed for kids to have fun and be able to play the course with full enjoyment. An ADA (American Dis abilities Act) course? Believe it! This course is done to ADA specs so the first 11 holes can be played - and the owners who we met with, told us that they will let the player start again too to play up to the full 18! The concept and design is thoughtful. We have played the course many times and have enjoyed it always. Also, you can have real Water Wars where you toss water balloons across a field (see diagram) – kids (and adults) love it – you will be wet though! Fun stuff! Now these are not just your typical metal framed go-karts. Nope. These cool cars are "Formula K" go-karts that are super-cool looking, with full bodies in bright colors, racing along a great brand-new "Dragon's Tail" race track. These are the best go-karts we have ever seen, and we know you and the kids will just love racing around this track after a nice round of mini-golf and some arcade fun. You must make Egg Harbor Fun Park an outing for you and the family - there is now so much to do here, you can literally spend the day! Zoom!! Zoom! Drive safely! Walk in the building and order some food. There are some tables inside the ADA accessible building for dining, as well as some tables outside too! We chose to sit outside the last time we played, and enjoyed watching other golfers work their way through the course. You can choose from a variety of very good pizzas (people here love the pizza), or grab a hot dog, brat, nachos & cheese, or filled pretzels – oh yeah – this sounds good: stuffed pretzel selections include Cinnamon & Apple, Jalapeno Cheese Pizza, and Cream Cheese. Fun stuff! They also have an Chocolate Shoppe Ice Cream – with high-quality hand-dipped ice cream cones, sundaes, malts, shakes and more! Very cool (literally)! We love it! After playing mini-golf, the arcade, water wars, go-karting and more - you can stay and eat too! And, Egg Harbor Fun Park will host kids parties as well - what a great idea for a special birthday, graduation or other special event! See below. The Arcade and Redemption Games! Had enough fun yet? Well, there is more inside and kids will love this too! In the main room, which you can access from the go-kart area or from the mini-golf area, is the huge arcade and game room, housing about 30 – 40 cool games. Half the machines are “redemption” machines, meaning, you play with tokens and get tickets when you win. You can then turn the tickets in at the newly built “prize center” to claim your treasures! The other half are arcade style games from shoot-em-ups, to claw machines, racing cars, motorcycle simulators, air hockey and a ton more. They keep getting new ones - so keep checking back.And outside this year you will find "Jump Shot trampoline basketball." This is a fun game for two to play - you must see it and try it - kids love it! Traveling with a group (like Scouts, etc) or with the extended family? Then call ahead 48 hours and have them host a party for you! The Group Rates (12 people or more) include packages with mini-golf, Water Wars, and game tokens, go-karting. etc. at various per-person price points. The “Party” packages (check for minimum number of kids required)) range in price per person, depending on how much stuff like mini-golf, Water Wars, go-karts, tokens and food you want! Talk about fun! If you have a group camping at the Door County Camping Retreat not too far away, arrange a great outing! We have seen lots of groups in here having a wonderful time! Tell them we sent you! So spend a few hours or a whole day at Egg Harbor Fun Park. Golf, have a Water War, eat some super pizza, race around a fabulous go-kart track, play the arcades and prize games and have a blast! No one else in Door County has all this in one place! So head over to Egg Harbor Fun Park, on the south end of Egg Harbor, and tell Mark and Kevin that DoorCountyNavigator.com sent you over! There are Super Passes you can purchase right at the park for great savings! Below are examples of the Super Passes available at Egg Harbor Fun Park. This is a great deal so get one or a couple! The passes below are not usable, as the purchase must be made while you are at the park. Have fun and tell them DoorCountyNavigator.com sent you!